Hi guys – I’m back! Can’t believe it’s been 4 months since I last posted. A lot has been going on and I have a huge backlog of photos to go through and places to write about. After a while, it just feels too daunting to even begin. You know what I mean? Or am I just the laziest blogger around (that’s entirely possible!)? So let’s take a little trip back in time – to February, 5 months ago. I had just said a tearful goodbye to my host family in Intag, where I’d been staying for the last 5 months, and headed off to see more of Ecuador. 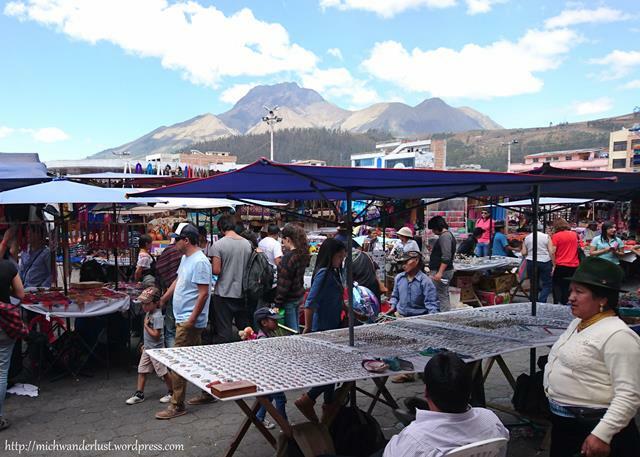 Otavalo is most famous for its Saturday market, apparently the biggest indigenous market in the whole of South America(!). It’s a great place to get affordable crafted goods and souvenirs, although I think some of them are mass-produced. 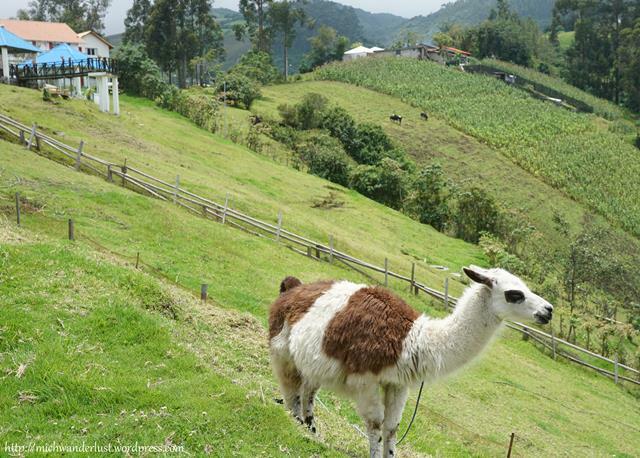 It’s also just 2 hours by bus from Quito, so many people just visit as a day-trip. 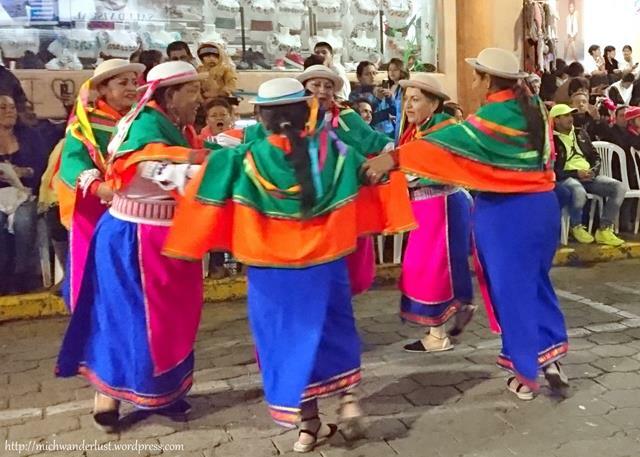 These tours depart from Quito in the morning, bring you to the market, make a quick photo stop at Cuicocha Lake, and then head back to Quito. 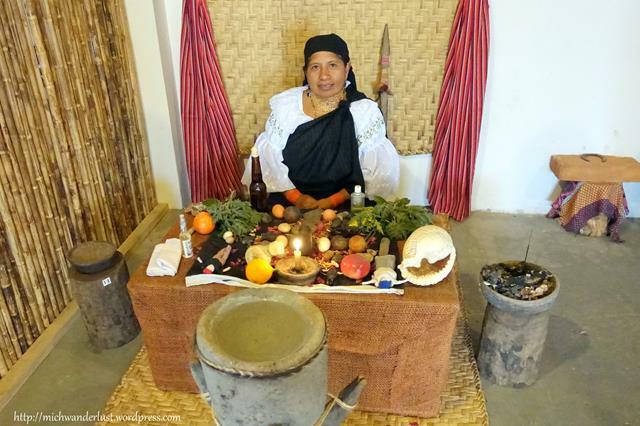 That’s fine if you’re pressed for time, but Otavalo is full of hidden gems if you spend a little more time there. And if you come in the first week of September, you’ll get to enjoy the harvest festival (Fiesta del Yamor), which kicks off with a colourful and unforgettable parade. I’d spent quite a lot of time in Otavalo and had seen all this already. There were still places in Otavalo and the surrounding areas I’d been wanting to visit, though. So I finally crossed them off my to-do list. First, we splurged a little on accommodation. I read about this on Lonely Planet and it sounded lovely. Plus, I was feeling a bit down after leaving Intag and wanted to treat myself to someplace nice. And it didn’t disappoint! It’s basically a collection of cottages, each decorated differently and located all over the property. So the price varies from room to room. We chose the cheapest option available (I might wanted to treat myself but I still had a budget!). 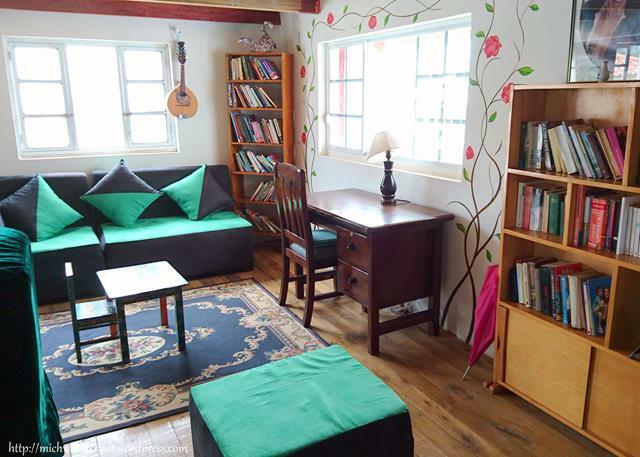 It was about USD57 a night for a cute and spacious double room on the ground floor of one of the cottages. The views from the hosteria are gorgeous (like a guesthouse in English – neither a hotel nor a hostel). Apart from the views, the grounds themselves were so pretty that we could have hung around the estate the entire time without going into the city. 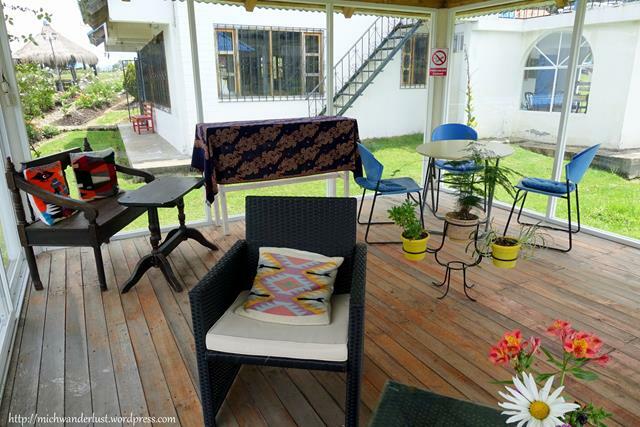 There was a sunny sitting-room conveniently located near the restaurant (so they could bring you food and drink). A cosy library with a surprisingly good collection of books: one of the reasons I could have easily spent my entire stay within the estate! The picture above is actually just one corner of the library. It was spacious, with plenty of bookshelves, sofas and even a grand piano in the middle of the room! It’s basically my dream library. 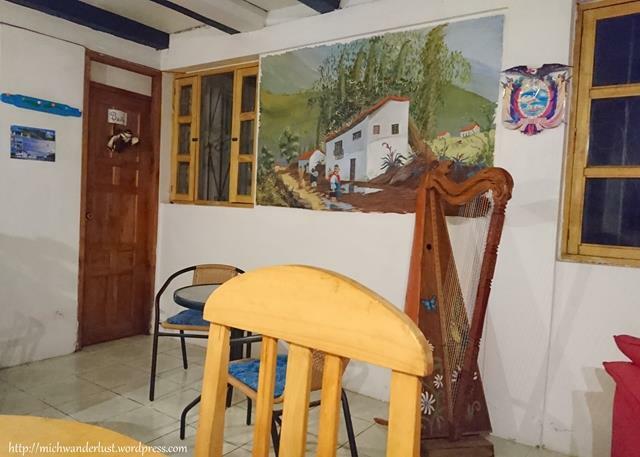 And then there’s the restaurant, with a somewhat random harp in one corner, and a fireplace that they light in the evenings. It’s almost as if you’re eating in someone’s dining room. The menu isn’t terribly extensive, but there’s enough variety so you won’t get bored even if you eat there for a few days. The set dinner above (vegetarian pasta, salad, popcorn, dessert) cost about USD9. It’s a little pricey by Ecuadorean standards and you can get meals for much cheaper in the city. But after you factor in the cab costs (USD3-4 each way, or at least half an hour on foot) it’s almost the same. As for the food itself, I thought it was decent (but I’m not a fussy eater). 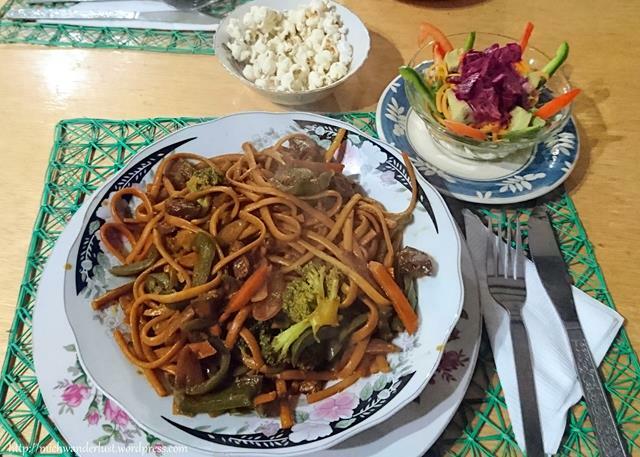 The first time I ordered vegetarian pasta (above) it was like a stir-fry, which I liked (Asian here!). The second time I ordered it, it was more like an Italian-style tomato-based pasta. Still vegetarian, but completely different. 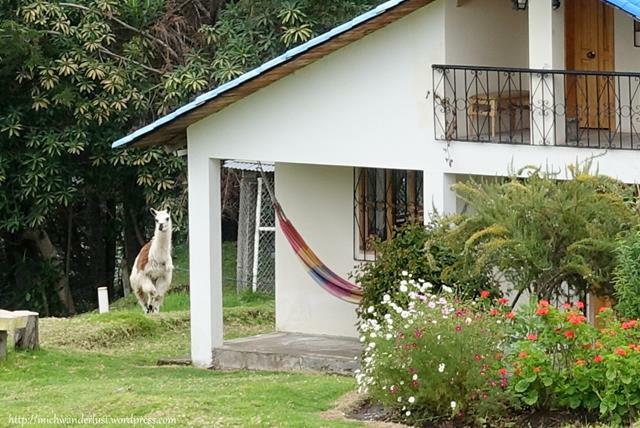 There’s also a jacuzzi (in the first picture above), a tennis court, playground, foosball table… oh and also a resident llama! The friendly Ecuadorean owner, Rosa (hence, Rose Cottage! 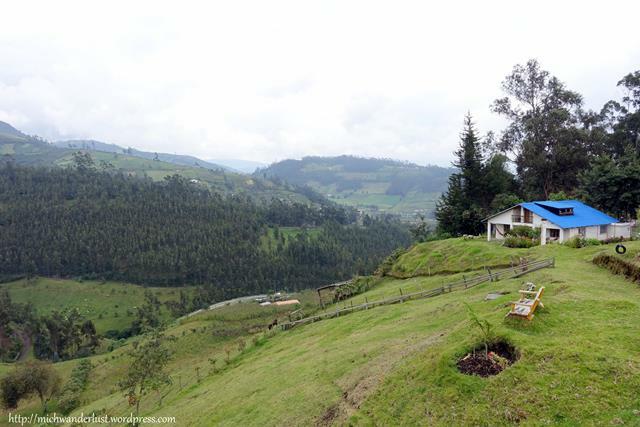 ), said that many visitors are Ecuadoreans looking for a peaceful getaway. Mission accomplished, I’d say! I didn’t even see a TV, although I think they do have a TV room. Wi-fi is available though it can get slow (as in all parts of Ecuador). Now, if you read this blog regularly you might know that I rarely talk about accommodation in much detail. That’s because I don’t like splurging on it – it’s just somewhere to lay my head at night. As long as it’s clean (and there are no bed bugs! ), I’m fine. Rose Cottage was different. It was perfect for what I needed at the time – somewhere near enough the conveniences of city life, but still close to nature and its soul-healing powers. I was seriously tempted to linger an additional night (or two), but we had to move on. One of the things I liked best about Rose Cottage was the detailed maps with directions for hiking trails. As it’s located a little way outside the city, there’s plenty of good hiking around. I’d have loved to explore more of the trails listed, but we only had time to do one short hike – to the Taxopamba waterfall. The hike doesn’t take long – less than an hour to reach the waterfall from Rose Cottage. But it does involve quite a few ascents and descents, so it’s enough of a workout! Beautiful views of the countryside made it worthwhile. We did take a wrong turn at one point, but asked for directions and arrived without any major hiccups. As far as waterfalls go, this isn’t the most scenic waterfall in the world (but I’ve also seen far less impressive ones!). I liked that there weren’t too many people there, and they were almost all locals. It felt like we were sharing in a secret not known to many extranjeros (foreigners). Don’t you love that feeling? All in all, if you only have 24 hours to spend in Otavalo, you probably won’t get around to visiting this waterfall. The Peguche waterfall (which I mentioned above) is by far the bigger and more famous one. But if you have a few days to spare, and want to wander off the beaten track a little, this would be perfect. 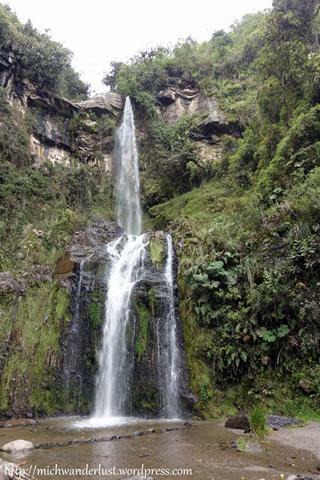 The waterfall is located in the community called Mojandita, a little outside the city of Otavalo. A cab there should cost between USD3 – 4 (the cabs are not metered and they charge flat rates based on the destination). Pro tip: confirm the price before getting in the cab. The Otavalo cab drivers I met didn’t try to rip me off, but I made sure I knew how much they should be charging me. If you want to walk there, it’ll take at least half an hour to get to the Mojandita area and the road goes uphill. In all cases, be prepared to ask for directions along the way as there isn’t a lot of signposting on the roads or the trail. 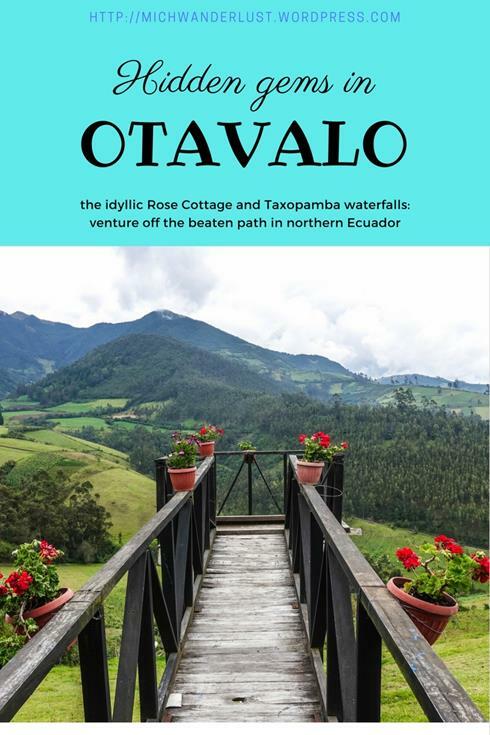 In my next post I’ll explore more hidden gems of Otavalo’s surrounding areas – they’re more famous than these waterfalls, but require some effort to get to, and so are bypassed by most visitors to Otavalo. How do you discover hidden gems when you travel? I’m a fan of hidden gems, so please share any tips you may have! Wow!! That looks great. I always think that those ‘quick visit tours’ are such a shame, your story definitely proves that taking your time pays off, big time. I mean, that waterfall!!! We had the same experience in Sintra, Portugal. 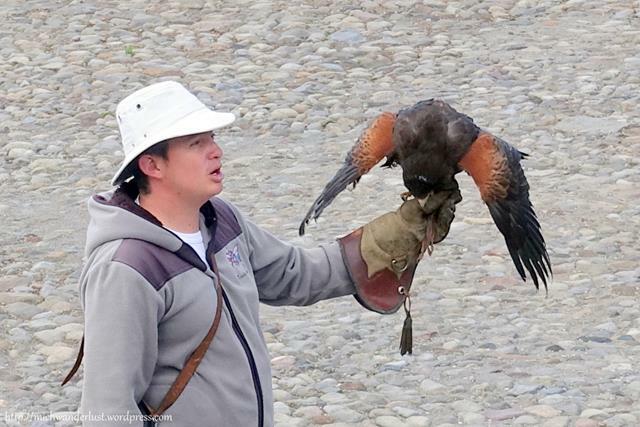 People normally stop by on a daytrip from Lisbon, only visiting one Castle. My husband and I decided to stay for 2 nights and explored the town when the crowds were gone, saw the not-so-famous palaces (that were also brilliant!). Thank you for your inspiration!! Thanks for sharing your story! I haven’t been to Portugal but I’ve heard such good things about it. 2-night stays are so much more relaxing than 1-night stays, aren’t they? Simply because you don’t need to be constantly packing and unpacking! Rose Cottage looks like a great place to getaway and love the pretty waterfalls! Yes, it’s such a nice change from the usual hotels / hostels 🙂 Thanks for dropping by, Jessica! 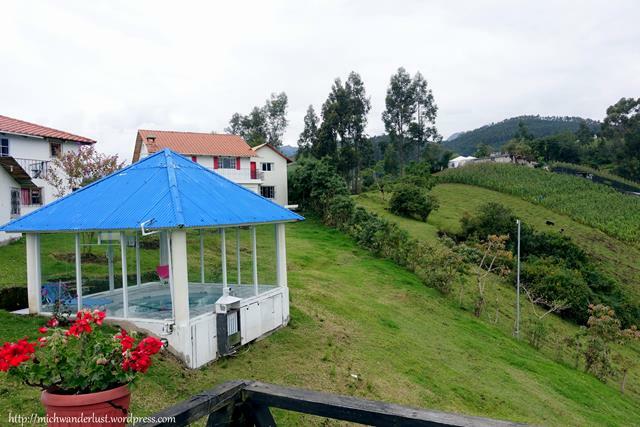 I wanted to do the day trip to Otavalo when I was in Quito but thought it would be too rushed. 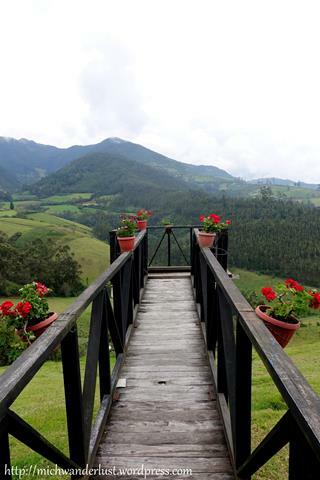 I would love to go back, stay at Rose Cottage, go to the market, and do some hiking. Thanks for sharing on #TheWeeklyPostcard. Yeah I think the day trip is pretty rushed! They pack a lot into a few hours. Hope you get to go back one day. The fact that they use USD must be really convenient for you 😉 Thanks for dropping by, Anisa! You do not have to do a lot of convincing in my case. I love places surrounded by waterfalls! 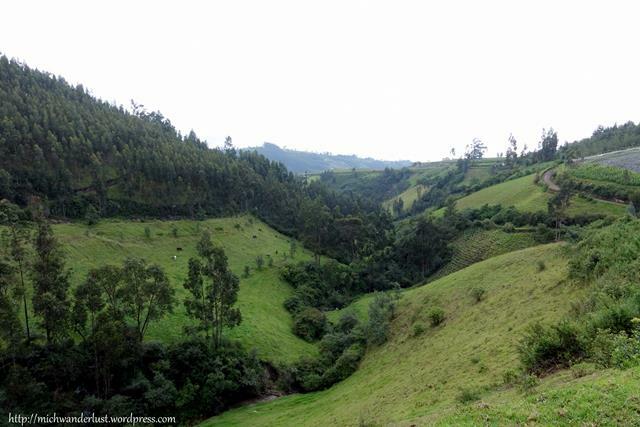 Agree that a day trip will be two little time to explore Otavalo. I would like to explore like you. And that cottage looks so nice! The Iguazu Falls look incredible, waking up next to it must have been an unforgettable experience. I’d definitely love to see it for myself one day. Hope you make it to Otavalo one day, Anda! The cottages are gorgeous I bet your mood picked up after staying there 🙂 Did you notice if there were any family friendly options as the cottages. yup, there were a couple of large families staying there while we were there!